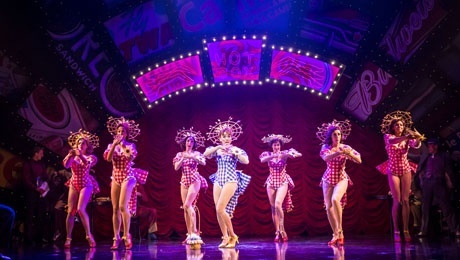 Hallelujah – Guys and Dolls is an odds-on winner! 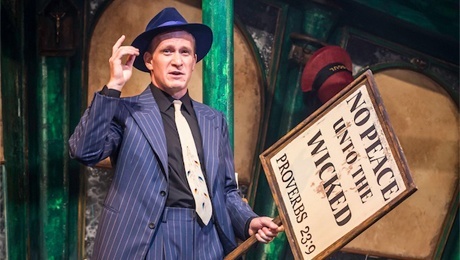 The tale of 'saints and sinners' in Prohibition New York is a feast for the eyes and ears with exuberant dancing, toe-tapping tunes and a cracking cast. As you'd expect from a West End-standard production, the singing is superb, the lighting lavish and the sound sublime. Most people will know the musical comedy, based on a Damon Runyon story, through the 1955 movie starring Marlon Brando (Sky Masterson), Frank Sinatra (Nathan Detroit), Jean Simmons (Sarah Brown) and Vivian Blaine (Miss Adelaide). In this new stage production Jamie Parker is Sky Masterson, Siubhan Harrison plays Sarah Brown, Sophie Thompson is Miss Adelaide and David Haig takes the role of Nathan Detroit. It is the first time Sophie Thompson and David Haig have performed together since their comic pairing as bride and groom, Lydia and Bernard, in the hit film, Four Weddings and a Funeral. Nathan Detroit is desperate for quick money to stage an illegal dice game. He thinks help is at hand when notorious gambler Sky Masterson, who can never turn down a bet, comes to town. Nathan wagers that Sky will be unable to romance straight-laced missionary Sarah Brown by taking her to Havana for dinner. Surely this is one bet Nathan can't lose? The situation is complicated, to great comedic value, by Nathan's attempts to avoid marrying Miss Adelaide, to whom he has been engaged for 14 years. And then there is the threatened closure of the Broadway mission hall, run by Sarah and her grandfather Arvide Abernathy whose aim is to save the souls of the area's gamblers and hustlers. The outcome is predictable – but it sure is fun getting there. The songs by Frank Loesser are classics and performed wonderfully by the whole cast. The lead actors and actresses can't be faulted. Sarah and Sky's duet, I'll Know, is a highlight. Siubhan Harrison has a lovely voice. Sophie Thompson lights up the stage with her singing, dancing and comedy timing. A real star. David Haig has chemistry with Ms Thompson and his rendition with her of Sue Me is both funny and touching. The supporting actors also shine. Gavin Spokes as Nicely-Nicely Johnson stops the show with Sit Down. You're Rocking The Boat, while Neil McCaul's Arvide Abernathy makes More I Cannot Wish You his own. Let's not forget the dancing. With Britain seeing professional performances every weekend on Strictly Come Dancing we now expect the best. Guys and Dolls doesn't disappoint. The influence of co-choreographer Carlos Acosta is obvious in the scenes in Havana and the New York sewer where the dice game takes place. The ensemble does a superb job with some challenging athletic moves. 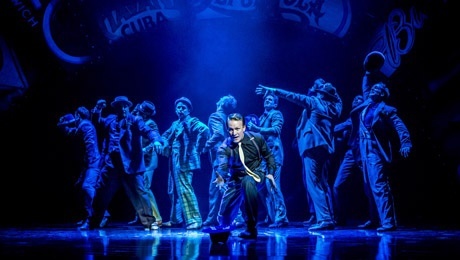 My bet is that if you buy a ticket for Guys and Dolls you'll have a great night out. July 26 - 30: Woking New Victoria Theatre. When: Until December 5, 2015. Then touring in 2016.